Victats: Do You See Something Different? 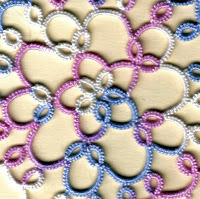 This is the last snowflake in this round for the doily I showed you a couple days ago. Do you see something wrong between A and B? 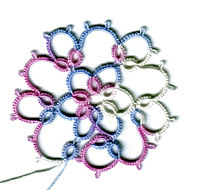 Apparently I didn't until just now, when I was a little irritated that my center picot was too large compared to the others in the doily. I know, a little knit picky cause apparently I missed the BIG PICTURE DIFFERENCE! You know, the one that makes what should have been the last motif in the round unusable in this particular pattern. I'll have to make another, no fixing this motif. Still can't see it? Try counting the rings on the center round. 5 rings on the correct motif Exhibit B but I threw in an extra repeat on Exhibit A to make 6 rings. Sigh, this is why I don't do more complicated patterns. Sob! I was so close. Really, I'm laughing on the inside. You never know when that extra motif may come into use at a later time. I do something similar at least every other time I sit down to tat. I cannot visit and tat, or watch tv and tat, or listen to a tape and tat, without tuning one or the other out periodically. And one Christmas I learned I most certainly could not tat, have a glass of wine and visit all at the same time! Every does that! Like Lady Shuttle Maker says it can come in handy... I've had mistakes turn into lovely new designs!